What “State” Do YOU Live In? We all have “states” that we live in. That could be happy or sad, euphoric or depressed, energised or tired, positive or negative, empowered or disempowered, focussed or distracted, grateful or ungrateful, and the list goes on. What state do you live in? From the age that I was 16 I wanted to change my life. I remember the very first book I bought was called the Power of Positive Thinking. I grew up in an environment with very few friends, but I knew from an early age that I wanted to saturate my mind with positive influences and positive messages to empower me to have a happy and fulfilled life. Next time your out shopping, or at work, have a look at the faces of the people around you, have a look at their body language and see if you can guess what states they are living in. Most people seem to go through life in a stressed, unfocused, unhappy or seemingly depressed state without direction, growth or contribution. Why is that? The great news is that you choose your state, no one else, it’s all you! What that means is that YOU can also change. YOU can decide to live in a different state. All you have to do is decide! Tony Robbins talks about how quickly you can put yourself in a peak state to achieve absolutely anything. He demonstrates this brilliantly in his Unleash the Power Within 4 day event I was fortunate to attend. I walked across hot coals in a peak state of achievement. An incredible experience. 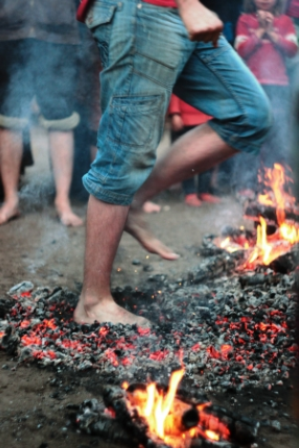 The firewalk is a metaphor for you being able to do anything if you put yourself in a peak state. What this means is using your whole body, your physiology, your mind, your voice and absolutely committing and seeing yourself as being completely unstoppable. So powerful. I didn’t get burnt, I didn’t feel pain, I didn’t even think about the coals. I put myself in a peak state and just did it…along with 5,000 other people. Most people aren’t living out their full potential because of fear. Put yourself in a peak state of complete unstoppable energy and see what you can accomplish, what fears can you remove from your life that are stopping you from reaching your true destiny? Not sure how to change your state, take advantage of our FREE consultation and we’ll show you. First step, just decide! Improve your state, raise your standards!